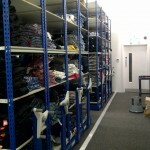 Storage and Interior Concepts were approached by a retail brand to help improve their warehouse storage and systems. We had begun with an initial onsite consultation of their current situation to get an idea of what they did have and what they would like for their requirements. With their requirements and needs outline, we initially started with mobile shelving to help with the storage of folded garments. 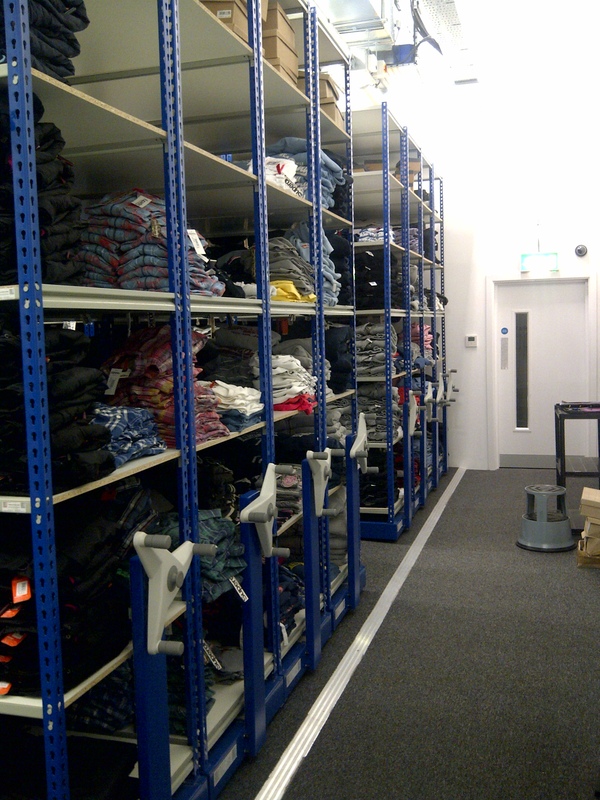 We have also incorporated storage for the shoe department also for the same retail chain. The image here is from the Birmingham store. Main benefit of mobile shelving is that only one gangway is required to access the bays. Allowing for retailers to make the most of the space available. With the scale of this project including two stockrooms. We were able to complete this on time as well as within budget. Onsite in Birmingham the mobile base tracks were installed directly onto the existing floor slab complete with an infill flooring between the tracks and a sloping front edge which eliminates any trip hazards. If you are looking to increase work space, or are refurbishing your warehouse, please contact Storage Concepts for a FREE no obligation consultation and quote. Storage Concepts undertakes work across the UK, for further information on shelving solution please click here.